Using Rosenthal and Jacobsen's Pygmalion Effect Theory and Bandura's Social Learning Theory, this chapter explores the perceptions of high school English/language arts and math teachers who teach low academic level track courses. 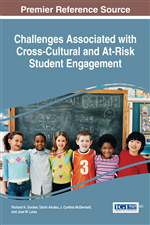 The teachers' narratives describe their beliefs regarding academic ability grouping of students and the associated achievement gap that is often a result of this stratifying structure. Findings from the narratives reiterate the importance of teacher awareness regarding the impact of critical pedagogy as a fundamental element of teaching for social justice. The chapter indicates the usefulness of teacher narrative to influence alternative methods for course placement and schedule design in the high school curriculum. Converted by Professor Higgins’ behaviors toward her and more importantly by Colonel Pickering’s belief in her, unrefined flower merchant Eliza Doolittle essentially transformed into a high society English lady based primarily on being treated like one. Likewise, disconnected, low performing students are capable of transforming into engaged, motivated scholars who have dreams and aspirations if only more teachers would treat them as such. Regulating the treatment that students receive from teachers, however, is one of the most challenging aspects of educating for equity. Teachers have their own unique moods and methods and attempting to manage a classroom filled with a multitude of students’ idiosyncratic personalities is a tall order for most educators. School/district, state and federal mandates aim to provide parity in instruction but continue to fall short as classroom teachers implement the goals and objectives of these mandates in highly dissimilar ways. The intentions of mandates such as No Child Left Behind and Common Core State Standards to ensure fair and unbiased instruction through accountability measures remain filled with failure. The Universal Declaration of Human Rights in 1945 precipitated the 1990 World Conference on Education for All in an attempt to standardize education internationally toward a common curriculum founded on social justice across national diversities and accompanying economic disparities (Chabbott, 2003). Despite these global efforts, challenges remained. Particularly in the United States, the shortcomings of No Child Left Behind (NCLB) encouraged the birth of Common Core State Standards (CCSS) that were rapidly designed to address the lack of accountability among state curriculum standards and to reduce the imminent inequities embedded within the existing mandate through diversity of implementation. While CCSS goals call for uniform instruction to decreases variance among access to quality education, governance of instruction is difficult at best and standardization of evaluation presents its own set of injustices (Au, 2008; Kozol, 2005). Ultimately, what we know about effective teaching includes curriculum and instruction built on engaging learning activities that prepare students to think critically about processes and ideas. Teachers who use critical pedagogy—a group of theoretical ideals born during the 20th century from a radical move toward social justice in United States education—overwhelmingly prepare students for success on standardized tests and furthermore, expand opportunities for college readiness and career attainment beyond formal education (Applebee, 2013; Darder, Baltodano, & Torres, 2003; Katz, 2014). More importantly, critical educators who prophesy that all students will learn as much as possible and who motivate students to seek excellence teach for social justice regardless of accountability mandates. This type of educator produces students who are considerably more than competent test takers. Classroom instructors and schools that promote critical pedagogy produce students capable of envisioning their futures apart from the unimaginative and unchallenged spaces often created by high stakes testing and endorsed by establishment reformers (Giroux, 2014; Gorlewski, Porfilio, & Gorlewski, 2012).